The Writers' Lens: STL Books - No Commitment Book Club! STL Books - No Commitment Book Club! Looking for a book club, but not sure you have the time? STL Books has a new book club – The No Commitment Book Club! Join STL Books on Wednesday, September 24 from 6:30 to 9pm for the first-ever meeting of “The No Commitment Book Club.” For the first pick, they are discussing The Weirdness, the debut novel of Jeremy Bushnell, who teaches writing at Northeastern. The panel will be reading the book as the weeks go by and randomly posting their insights on our Bookscape Blog. You can chime in with your own comments, too. The book includes discussion questions to get you revved up. Then, on the 4th Wednesday of every month (except December–they’re all really busy then), The No Commitment Book Club will hold a gathering at StLBooks. Arrive at 6:30pm for friendship, cheese and wine (bring a bottle to share). At 7pm, sharp, we will begin our one-hour LiveStream discussion. Everyone is welcome to participate–in the flesh or online. Heck, you don’t even have to read the book! But you’re going to want to! 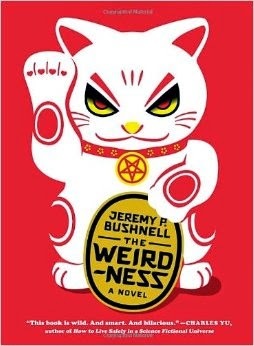 The Weirdness is available now at StLBooks. Just mention The No Commitment Book Club to one of our booksellers to receive a 15% discount, or purchase it on our website and use Discount code NCBC092014 at checkout. Ready to join? No need. Just show up on September 24th. STL Books hopes to see you, but then that's entirely up to you. Once the event starts they will be broadcasting live, participants can ask questions or make comments via a text chat that is just below the video and will be answered in real time. Once the event is over, the video will be uploaded to YouTube. Paranormally Yours Release Party 9/15! The Labyrinth of Time: coming Nov. 7!